(Newser) – Judicial authorities on Wednesday told the brother-in-law of Spain's King Felipe VI that he must report to a prison within five days to serve five years and 10 months for fraud and tax evasion, among other crimes. Inaki Urdangarin, a former Olympic handball medal winner who has been married for two decades to the king's sister, Princess Cristina, is the closest person to the ruling family of the Bourbons to be convicted and imprisoned. 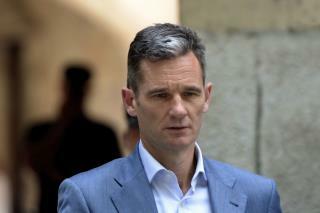 The provincial court ruled last year that Urdangarin embezzled about $7 million between 2004 and 2006 by exploiting his "privileged status" in the royal family to obtain public contracts related to sports events. Spain's Supreme Court on Tuesday upheld the lower court's decision, but it acquitted him of forgery and reduced his prison sentence by five months. Cristina, who became the first member of the Spanish royal family to face criminal charges, was acquitted for aiding her husband's crimes and only fined as a beneficiary in the scheme. She had already paid a $311,500 fine, but Tuesday's Supreme Court ruling on the appeal halved the amount. It wasn't immediately clear where the former duke will serve the prison sentence, although in theory he has the right to choose any of the facilities in Spanish territory. The couple has been living in Geneva with their four children since the first allegations of wrongdoing emerged in 2012. The case was seen as instrumental in prompting the abdication in 2014 of Juan Carlos I, who passed on the throne to Felipe, reports the AP. Do you think the US has the courage to do to its own nobility what Spain has done to theirs? I didn't read the story and don't care. But isn't a 'princess's husband' referred to as a 'prince'? With his wealth, I would so be moving immediately to the nearest country without an extradition treaty.